NASA's first-ever OSIRIS-REx mission designed to visit an asteroid and return sample of its dust back to Earth reached its destination - Bennu, two years after its launch. It will use its suite of five science instruments to study the asteroid for the next year and a half. It was launched in September 2016 for studying 101955 Bennu, a carbonaceous asteroid. It is NASA's first asteroid sampling mission i.e. it will survey the surface, collect sample and deliver it safely back to Earth. It will regularly observe area around the asteroid to search for dust plumes and natural satellites and study its light and spectral properties. It will return to Earth after collecting some of its gravels by 2023. It will capture 60 grams dirt and debris from surface of asteroid using its robotic arm without landing i.e. by hovering like a hummingbird stirred up by nitrogen gas thrusters and then to Earth for detailed analysis of the collected samples. Bennu is a near-Earth carbonaceous asteroid about the size of a small mountain in the Apollo group. It was discovered in September 1999 by the LINEAR Project. It orbits close to Earth's path around the Sun. It is one of the oldest asteroids known to NASA. It is a carbon-rich asteroid and believed to be the type of asteroids that may have chemical building blocks of life, along with lots of water. So, analysis of returned sample from it could help to reveal key insights about early solar system and the origin of life on Earth. It is a potentially hazardous asteroid and there is very slight chance it could strike into Earth in the late 22nd century. NASA's OSIRIS-REx is not world's first asteroid sampling mission. This distinction is held by Japanese space agency JAXA. It had proved world's first sample collection from an asteroid after its Hayabusa spacecraft crash-landed into the surface of its target asteroid and managed to return a few micrograms of material in 2010. 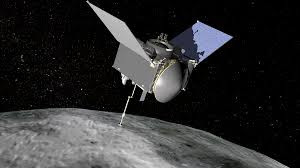 Q. NASA's spacecraft OSIRIS-REx arrives at which of its targeted asteroid after a 2-year journey?